After 25 years of caring for children, first as a nurse, then as a pediatrician, Carolyn Roy-Bornstein finds herself on the other side of the stretcher when her 17-year-old son Neil is hit by a teenage drunk driver while walking his girlfriend Trista home after a study date. Trista did not survive her injuries. Neil carries his with him to this day. Gratitude for her son's survival ultimately gives way to grief. While initially told Neil's only injury was a broken leg, Roy-Bornstein quickly finds herself riding in the front seat of an ambulance transporting her son to the ICU at Brigham and Women's Hospital in Boston; his brain is bleeding. Roy-Bornstein is now not the patient's doctor or nurse but his mom. The world she so easily navigates in a white uniform or a white coat now must be traversed, understood, and dealt with from the perspective of a parent. There are many dividing lines in this story. The line that divides this family's life in two: the events that occurred before the crash and those that came tumbling and faltering in its wake. 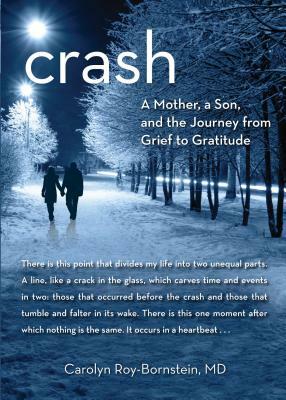 The line that separates grief from gratitude: gratitude that her son is alive and as whole as he is; grief for his loss of memory and changed personality and for having his whole world shattered in an instant. The line that separates the world Roy-Bornstein knew so well as a doctor from the new one she must now navigate as the parent of a trauma victim. In these pages she explores all of these boundaries: between then and now, grief and gratitude, before and after, us and them. Her many years as a "medical insider" bring her story authenticity and detail, while her newcomer status as the parent of a trauma victim add poignancy and warmth in this first memoir. Dr. Roy-Bornstein is an award-winning writer who has been widely published. She has also been a practicing pediatrician for over 15 years, caring for thousands of children in private practice, intensive care and the emergency room. She has taught hundreds of medical students and residents at Tufts University and the University of Massachusetts Medical Center the fine arts of listening and caring. She writes a monthly health column for parents called Pediatric Points in the national newsletter Pediatrics for Parents. Each issue reaches over a quarter of a million readers, and will include an Amazon link to CRASH and a reference to the book in her byline. She is an ambassador with the Brain Injury Association of Massachusetts, giving speeches to civic groups, schools and businesses. Audience members described her talk as "very touching and inspirational," "emotional and engaging," and "captivating." She has a web presence at www.carolynroybornstein.com and is a guest contributor to Boston's WBUR health blog CommonHealth. She was recently contacted by Bonnie Fuller, former editor-in-chief of Cosmopolitan and Glamour magazine to be a spokesperson for her new www.hollywoodlife.com web site when the opinion of a pediatrician is needed for a story. In each quote, being the author of CRASH will be mentioned. Her friend Andre Dubus III, National Book Award nominated writer of the novel House of Sand and Fog, will provide a high-profile blurb for the book. Her essays, book reviews, and clinical case reports have appeared in or been accepted for publication in numerous literary and professional journals including the Journal of the American Medical Association, Pediatrics, Pediatrics in Review, Archives of Pediatrics & Adolescent Medicine, the American Medical Writers Association Journal, Patient Education and Counseling, Consultant for Pediatricians, Kaleidoscope: Exploring the Experience of Disability Through Literature and the Fine Arts, Literary Mama: reading for the maternally inclined, Brain, Child: the magazine for thinking mothers, and Chicken Soup for the Soul: Grieving and Recovery. Her fiction has appeared in the Charles River Review and Hospital Drive and won third place from a field of nearly 8000 entries in the 2004 Writer's Digest Short Short Story Competition.